Dirt Devil’s M0914 Extreme Power Hand Vacuum was winner of the Good Housekeeping Good Buy Award for its supposed innovations when it first came out. It has such a low price tag, however, you wouldn’t expect that award or for it to even have such innovation – let’s take a look and see what the truth of it is. Some say that the Extreme Power is a little misnamed when they glance at it and see that has 15.6 volts. That’s pretty decent for a handheld, but certainly not at the top of the list in terms of just power. What they don’t realize though, is that design plays as much a part as power in creating suction. You can see what I mean by design and power working together when you use this vacuum. Its suction is all out of proportion to its 15.6 volts, and it excels at even bigger debris like bits of broken glass, or say, the mess from pets like birds or hamsters. It’s a consummate handheld vacuum – it’s made for small messes, and that’s what it does best with. With a built in brush and crevice tool (I’ll describe those later on) and its strong suction, this vacuum makes it very easy to clean both what it’s best at – small messes – and the odd places and surfaces those messes can sometimes get on. Remembering that design is a big part of the Extreme Power’s suction, though, you do have to hold the vacuum at a certain angle to get maximum effect. I can’t really tell you much about the Extreme Power’s battery itself – it seems to be something of a mystery that Dirt Devil doesn’t disclose and that no other reviewer has been able to find out about. I can tell you this: it’s probably not a lithium-ion, because it has a twenty-four hour charging time, but it at least has a very solid runtime of about fifteen minutes. This vacuum is pretty light – it’s 3.15 pounds. That’s a boon both in it being easy to carry around, and because of that particular angle it needs for best efficiency. The Extreme Power comes with Dirt Devil’s standard paper filter. It’s not the best filter out there, but it does work well enough and it’s easy to shake out and clean. This vacuum’s dust bin isn’t translucent unfortunately, but it is at least fairly large, which is a good thing given how good its suction is. Don’t fret when it says the Extreme Power doesn’t come with accessories – they’re built in, just like more expensive vacuums! A crevice tool flips down with one quick movement, and works great along baseboards as well. There is also a retractable brush for when you want to do a little dusting along your television and shelves. The Extreme Power is on the much more affordable side of vacuums, which would tend to indicate that it would be cheaply made. Remember, though, this is a Dirt Devil, which for many is the name in vacuums, and they have a reputation to keep for quality. You can see they know it, too – this vacuum comes with a three year warranty, so you can tell they’re expecting the Extreme Power to last at least that long. Dirt Devil sells this vacuum for a very low price, especially since you’re getting built-in attachments (I just looked at a vacuum with a similar feature that sells for more than twice as much) and great suction for a handheld. 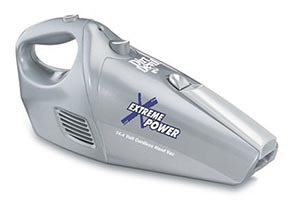 Now that we’ve gone through the ins and outs of the Extreme Power, it’s easy to see why it would have gotten an award even though it’s so affordable: it gives you some of the features of much more expensive vacuums for much less money. This vacuum would be ideal given its size and features for small spaces that often have small messes, or even to keep in a mobile home or car.